Sometimes you accidentally knock your board harder than intended when taking it out of the shed, launching from a dock, or doing any number of daily activities. 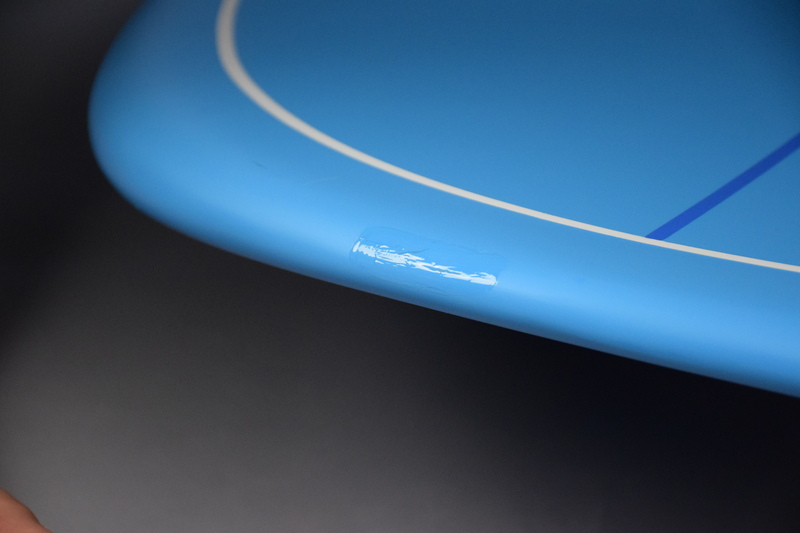 But when you hit your board against hard surfaces you can cause damage. While this is never ideal, the good news is that there is a very simple repair for minor damage that anyone can do at home. Before doing anything with your supplies, ensure that your board is completely dry. If you noticed the damage after paddling, let the board dry out in the sun for a full day, in order to let the board’s core dry out as well. Wipe down the board with a slightly damp paper towel. Let it dry for a few minutes to ensure there is no moisture left. Mix a small amount of Clear 2 Part Epoxy in your disposable dish with one of the paintbrushes. Using the same paintbrush, paint a small amount of epoxy over the entire crack, being sure to cover about 1/8″ of undamaged board as well. This will create a seal over the crack, preventing water from entering the board. Wait 30 minutes for the first layer to mostly dry, and repeat steps 2 and 3 with another batch of Clear 2 Part Epoxy and the second paintbrush. Allow this layer to dry for multiple hours (ideally overnight), until it is completely cured. If your board is more seriously damaged, a full fiberglass repair may be necessary. Check out the following link to learn the steps of a more significant repair job.